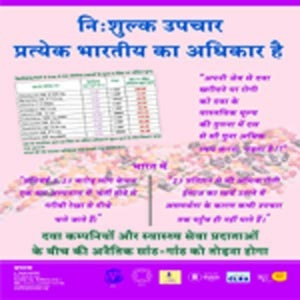 The launch of Jan Swasthya Abhiyan (JSA) or People’s Health Movement (PHM) in 2000 was marked by a campaign “Health for All-Now” and since then there have been many activities to realise it. 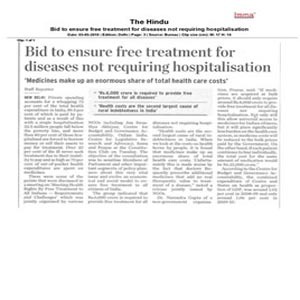 In order to move further towards this vision, there is a need for a strong campaign to ensure free treatment to all persons of India (except perhaps the income tax payee) as it is seen that in spite of the launch of National Rural Health Mission (NRHM) there is hardly any reduction in the out of pocket expenditure (OoPE) of the people in seeking health care. As a result, vast majority of citizens of this country have to spend up to 80% of health care expenditure from out of their pockets. 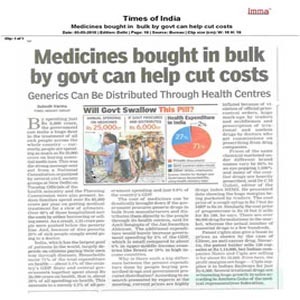 It has been amply established that out of pocket expenditure is the biggest barrier in accessing health care from publicly financed institutions and one of the major cause of continuing indebtedness and loss of assets especially of those more than 50% citizens of this country whose daily income is less than Rs. 45.00. This is largely because receiving care from Government health system still remains very expensive. This campaign is all the more necessary because when the UPA formed Government in 2004, it had promised through Common Minimum Programme (CMP) to increase the fund allocation up to 2-3% of the GDP gradually. But still the allocation after five years is stagnating at 1.1% of the GDP because even in the flagship programme of NRHM, there is no provision for free treatment and no state Government on its own wish to do much into it.